There was a time in the United States when outlaws became folk heroes and their exploits, the government’s hunting of them, their capture, and often their demise were the top entertainment of the day. Before radio, television and movies cam around, their stories were spread by newspaper journalists and dime novel writers who frequently told exaggerated stories about outlaws out in the “Wild West.” These papers and books sold very well to people living in cities who longed for adventure. Here we count down the seven most infamous bank robbers in U.S. history. A true bank and train robber, Jesse and his brother Frank were the most feared outlaws in the United States for more than two decades with more than 20 robberies. They earned a warrant with the “Dead or Alive” status in 1869 when Jesse killed a banker in Missouri. 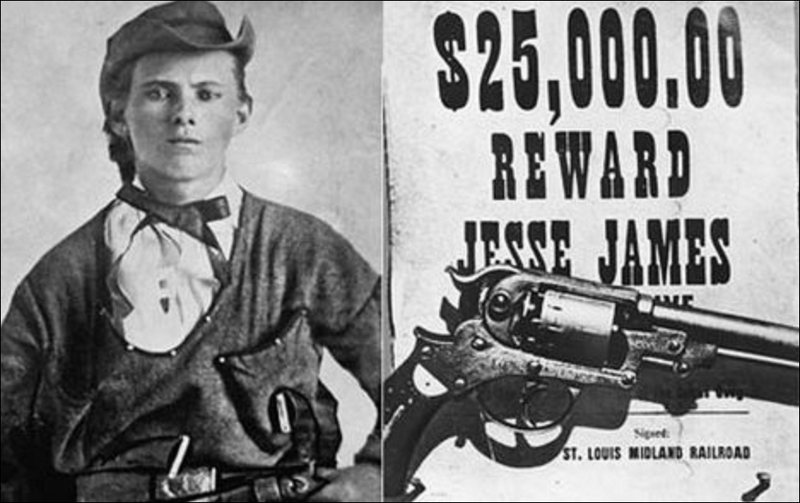 Jesse was shot in the back by James gang member Robert Ford; Frank surrendered. No jury would convict Frank so he lived out his days quietly and without further incident.